Our Guild, like so many others has a Block of the Month feature. In 2005 our Guild BOM incorporated simple blocks into a complex sampler arrangement. Some of the blocks included a bordered 9-patch, rolling 9-patch, log cabin, curved log cabin, Geese in the Courthouse, Interlocking Squares and Amish pinwheel. I didn't usually participate in the BOMs but this one intrigued me. I chose my fabric; Remember When by Kaye England for Benartex and Monticello by Jinny Beyer for RJR. I made four of each block, pieced them together into one larger square and then set them in a nine patch setting and adding sashing. It took several years to complete the hand quilting. Here is what resulted. Oh! Those blue and purple things on the left side? Yup those are ribbons, and so is the white and red one. The blue and purple ribbons were presented by my Guild for Best of Show and Viewer's Choice at our show in 2008. 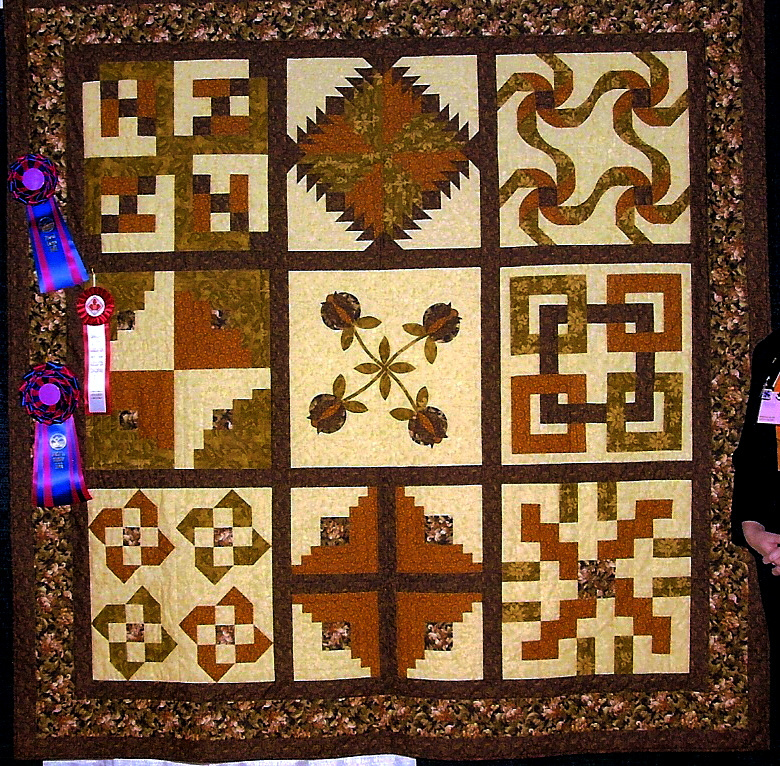 The red and white ribbon is the Canadian Quilter Association Rosette, given in recognition of the Best of Show win. 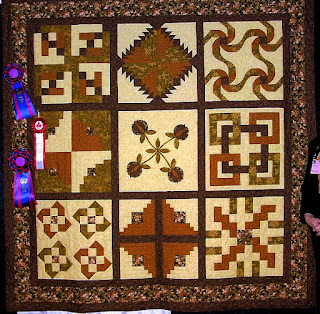 That is an amazing quilt, I particularly like the central block. Really lovely!